There's a new vairant of the Facebook Token Hijacker malware on the loose, and this time it's improved. The new version of the malware now has improved obfuscation techniques to keep its code hidden from anti-malware software. 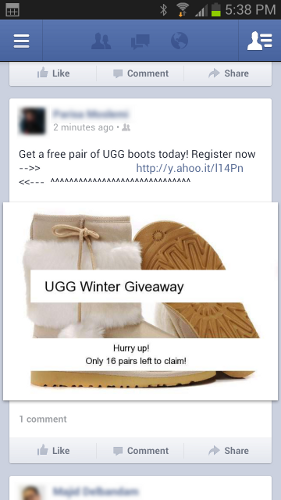 This malware sends the target user a post on Facebook claiming a special offer on UGG boots, and the user is asked to post her access token after logging into an application using Facebook's oAuth (the app ID is 350685531728). After successfully logging in, the malware hijacks the user's token and starts posting on her wall. In addition to posting, this malware also attempts to create an event and invite all the victim's friends to it. Unlike typical phishing attacks, this attack starts exploiting the victim immediately and automatically (without being challenged by Facebook's Identity and Access Management Controls) after obtaining the necessary data.